I hesitated posting this – the old me would have kept this to herself. She would have said, chin up. She would have smiled a smile in vain. And kept her emotions in check. Her broken heart hidden. But the spirit and soul that’s resided within me all along; the one that I’ve finally tapped into, knows better now. I’ve come to realize. To truly understand. The bravest thing to do is to share my words so they can set me free. I’m really not one to dwell on what I no longer have. Life would be vacuous and pointless. I’ve lived most of my adult life spinning skeins of multi-colored yarn into a warm blanket of love and understanding. Celebrating an acceptance of diversity, changing out the color and texture as necessary. Applying a delicate touch or a stronger hand according to my children’s needs. Tomorrow is Mother’s Day. And every year on this day, my willful mind becomes a sojourner as my broken heart follows along. It remembers all too well, the first Mother’s Day after our son’s death in December. Before I could even make it to the bathroom, tears plummeted from reservoirs deep within me that had apparently been stockpiling them for awhile. I’d rehearsed in vain, how this day would be; how I would be, but having ineptly practiced the art of grieving the loss of a child, I’d learned that we must first empty ourselves of seemingly all the tears we have, in order to be filled with love and healing again. Our tears fill the void until we’re ready to drink from life’s fountain ourselves. My version of strong that first Mother’s Day without him, wouldn’t hold the dam. Why should it anyway. Outside it was a gorgeous, bright day that contrasted my emotions. How dare the day be so beautiful, I thought. I gazed out the window at the pink and white peonies, whose heads were heavy in the morning sun. Brightly colored pansies lined the brick patio above. Usually my breathing space: not even my flowers could charm me today. They only served to remind me how hopelessly sad I was. I wandered back to bed, trying to summon up a mere scrap of my former self to hold onto. Fighting hard for some semblance of light to keep me from being swallowed whole by the darkness of the grief monster. As I sat in bed feeling utterly absent amongst familiar surroundings, my husband walked in carrying a tray. On it were the usual accoutrements of a beautiful Mother’s Day breakfast in bed. Eggs benedict and bacon, cappuccino and orange juice. 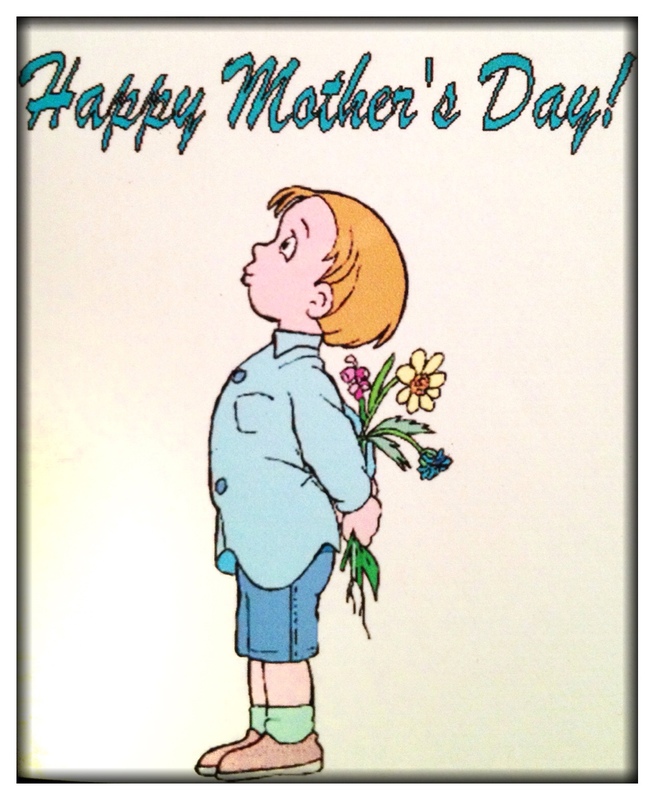 And a card made by my husband…from our son, Preston. As I looked at the boy holding flowers, sans wheelchair, pieces of my heart slowly bled out until there was nothing left. Weak and drained, I’d given in to this piercing pain again. Through hazy, tear stained eyes, I gazed out the window to the blue sky above, once more. This bright and beautiful day made sense after all. Thank you dear son, for sweeping the clouds away. Yes, my beloved boy – you do live up there. Running, skipping and jumping. Free of the body that kept you trapped. Free from pain. And yes, you will forever live on in my heart, in my mind, in my actions and my deeds. Though you are gone from this earth, I will forever weave a tapestry of love; so thick and rich, so bright in color it can’t be missed. Like that of the love you left behind. I’ll wrap it in between and around all the people I love. I promised you I’d be alright and to that I will hold true. But…this Mother’s Day will prove to be a challenge again. It will be my first one without any children. Our sweet daughter has a bachelorette party to attend. Who plans a bachelorette party on MD weekend when the wedding isn’t until July, anyway? But I’m not (am) bitter. I’ve always had her wit and humor to get me through the day. Her mere presence reminds me of the blessings that I have. As I write this, I silently whisper to her…miss you already. Her love is that soft texture to the touch I’ve come to count on oh so much. I realize I’m being a bit of a whiny baby right now. One day she will have her own children and our Mother’s Day arrangements will fluctuate based on the needs of her own family. And that will be just fine. Consequently, for this Mother’s Day I’ve informed (threatened) my husband that he’d better have a HUGE day planned for me. It should include an amazing outing complete with some (a lot of) mimosas. I see deep dark chocolate in my future, as well, if he knows what’s good for him. And so, as we did throughout our son’s life: I will meet and greet this day with an abundance of humor and love. And I will think of all the other moms who are in the same situation as me. The “new to the club moms,” who are reluctantly celebrating their first Mother’s Day minus a child to hug good morning, as they look out their window and wonder why. I’ll think of the moms who are preparing to say good-bye to a child, knowing this is their last Mother’s Day with them, and I’ll offer up healing meditations for us all. I’ll be kind to myself and I’ll remember what strength a tear can hold. And I’ll be thankful that I have, still, a best friend in my wonderful daughter, and an amazing husband who will catch me if I fall. This entry was posted in Inspiration, Motherhood, Women and tagged courage, daughter, death, Empty nest, family, healing, Inspiration, life, loss of a child, mother, Mother's Day, NESTpirations, Women, wordpress. Bookmark the permalink. This was a special moment for me, Karen. It was one where I saw inside your heart, made me get teary eyed and did not shed the tears, held inside due to being in a library. I am so sorry for your loss of a son, I could not even imagine how it felt. I will someday lose my Mom or maybe a sibling, but will still not feel the inconsolable feelings of outliving a child. I am glad for your realizing that he is in a better place, hope you feel his presence. I look at the night sky and think of my Dad rearranging the stars. I have two friends and two brothers who have been stepparents but never had children of their own. They have poured their heart into these relationships. I feel for them, on such days, since the stepkids tend to think of them as ‘extra’s’ in their lives but not ‘real’ parents. I am so glad you have the love of a good man and daughter. This made me feel closer than ever, to you. Take care and Happy Mother’s Day for all the blessings and memories of having your son, and your living daughter, too. Aww- so glad it meant something special for you, Robin. That means so much to me to reach someone else’s heart. It was an amazing journey with him, for which I will always be blessed to have experienced. I love the imagery you wrote about your Dad rearranging the stars – I shall remember that my friend. You’re absolutely right- there are a lot of unsung heroes out there who never get the recognition they deserve. I’m so glad you decided to write and post this, Karen. I have no doubt, it will help many who have not only lost their children, but have lost their mother this past year. Preston is smiling down on you and probably wishing we could all be in such a glorious place. Thank you so much, Jill! I am learning more and more, NOT to hesitate with my writing. If one sentence touches someone else’s heart – it resonates again in mine. I write on my phone as I sit in the car with Pop, Mum and Mr S. The sun shines through the car window on a chilly autumn day and a tear trickles down my cheek. Tears filled my eyes as I read your eloquent comment. I pictured you in the car and I’d like to think that the warmth you felt truly were the words reaching across the universe from my heart to yours. That’s really what it’s all about – isn’t it. And thank you oh so much for attempting to re blog…how honored I felt. You know how much I respect you and your writing, dear Jen. 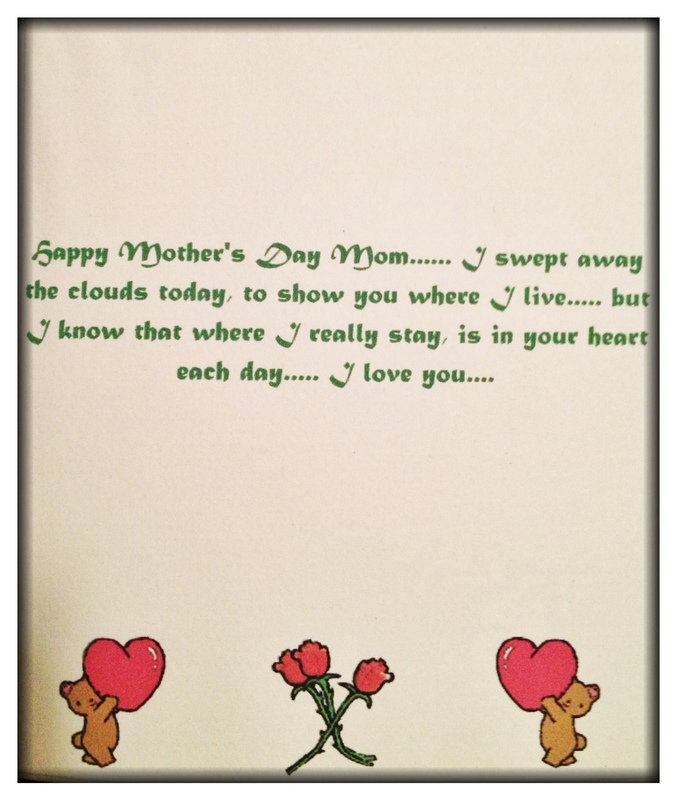 Mother’s Day is such a difficult day for so many and you have expressed your feelings so beautifully in this post. I’ve never experienced the loss of a child, but the sense of loss must be devastating and constant. From what I’ve read of you on my blog, I think Preston was one lucky boy to have you as his mom. I have a hard time sharing what’s in my heart and on my mind and appreciate the raw honesty that you have shown in this post. I think you are a very courageous and loving woman. And really, who does throw a bachelorette party on Mother’s Day weekend???? I sincerely believe that one of the reasons I was ‘gifted’ Preston was to cause me to write and to feel in a manner that would have otherwise been unknown to me. Right on – WHO throws a bachelorette party on MD weekend? Really!? My daughter wasn’t happy, but had no choice. Oh my heart is breaking for you. I’m glad it’s a year behind (almost). I’m afraid to read your blogs from those early days. Hi Jacqui – thank you for your sharing your sympathy. Preston died December 20, 2006. I was referencing my first Mother’s Day in the post. Eight years. You’ve come to some sort of peace. That’s good. So sorry for your loss and missing your son. What a lovely card and a beautiful post to share about your wonderful son. Thank you for this beautiful post. Heartbreaking but also so eloquently honest. I know what it takes to write these posts. Draining and liberating at the same time. Hugs and love to you. Next time I drink a mimosa (hopefully on Sunday), I will think of you and your son.